TS and MY Series motor are closed and fan cooled. TS series includes induction threephase 2-4-6-8 pole motors 230/400 Vac at 50Hz and 275/480 Vac at 60Hz, it covers power sizes from 0.06 kW up to 18.5kW. 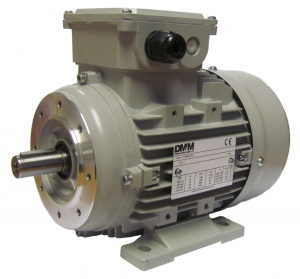 These Motors run quietly and are dynamically well balanced, they match quality, strength and cheapness. MY series includes induction singlephase motors 230 Vac at 50Hz and covers power sizes from 0.09kW up to 0.75kW. They are particularly suitable to be mounted on machines for low power applications. As well as TS series motors, they match quality and cheapness. Both seires are made in aluminium frames and are available with B5 or B14 flange mountings. B3 only for TS series. – Heavy and light industrial application suitable commercial ones.